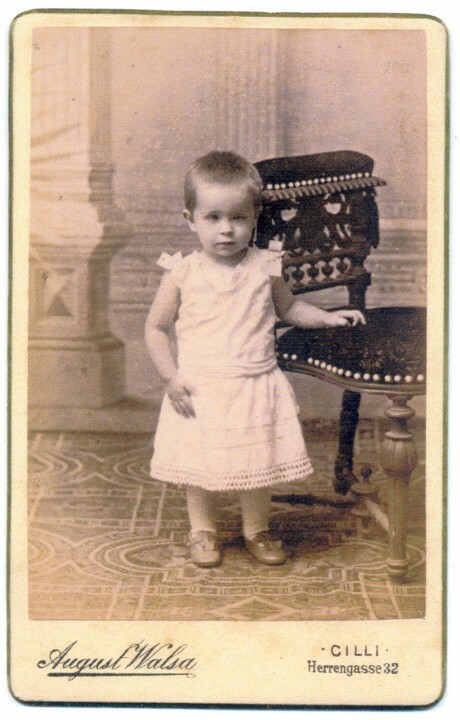 1889 She was born on 12 October in Celje. 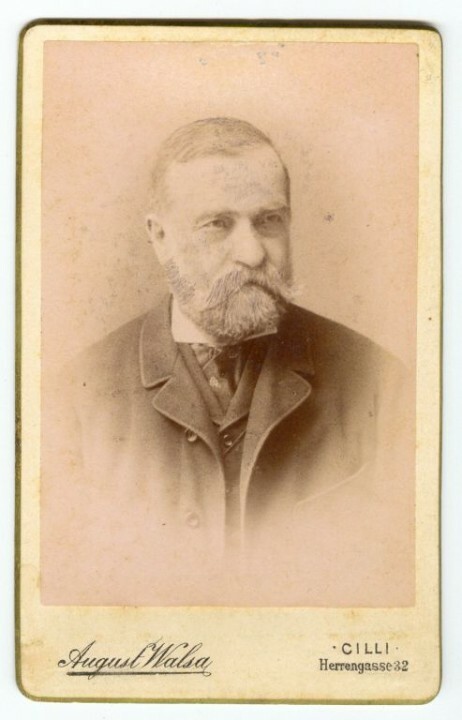 Her father, Jakob Karlin (born in 1829), was a retired major of the Austrian Army, and her mother, Vilibalda Miheljak (born in 1844), was a teacher at the girls` school in Celje. 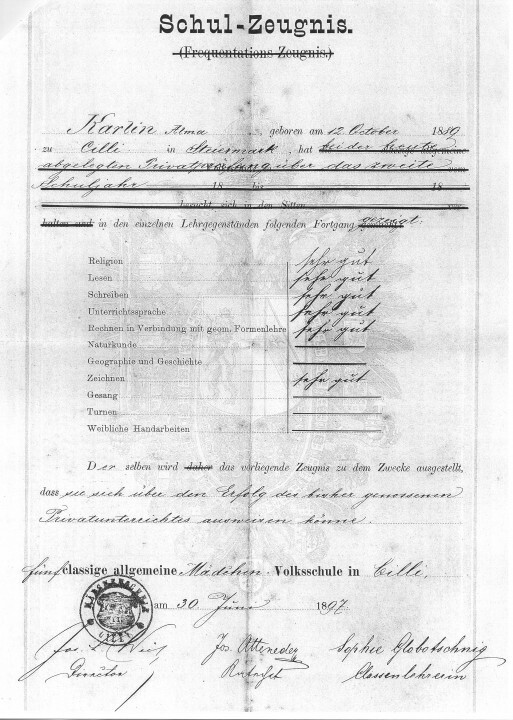 German was spoken in the family. 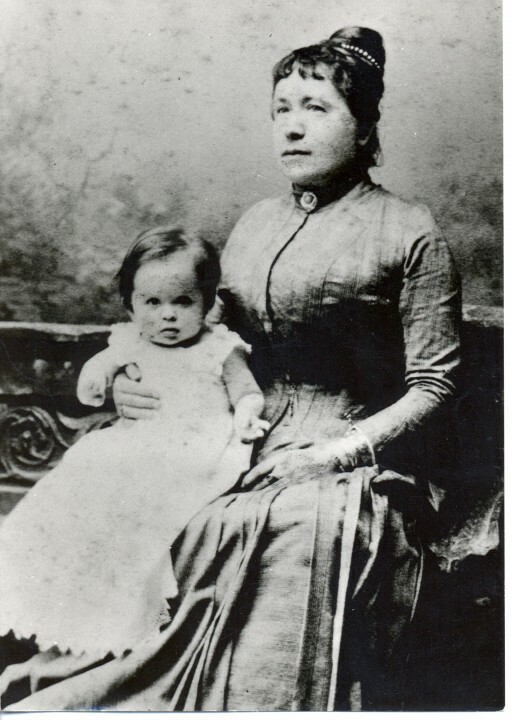 1898 Her farther dies of tuberculosis, Alma travels with her mother round Dalmatia and Herzegovina . 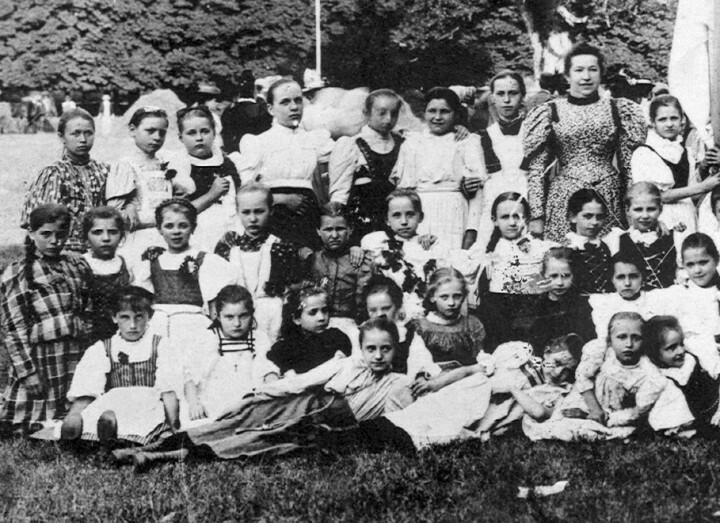 1898/99 Due to her poor health she is taught privately the first two classes of the primary school, and attends the third class at the girls` school in Celje. 1903 Alma`s mother notices she is lame. Painful visits of an orthopaedist in Graz follow as well as a long lasting tiring remedial gymnastics because of which Alma frequently stays away from school. 1904 Alma agrees to take a medical treatment in the orthopaedic institute in Ljubljana where she is doing tiring exercises under the supervision in the morning and in the afternoon for several months. 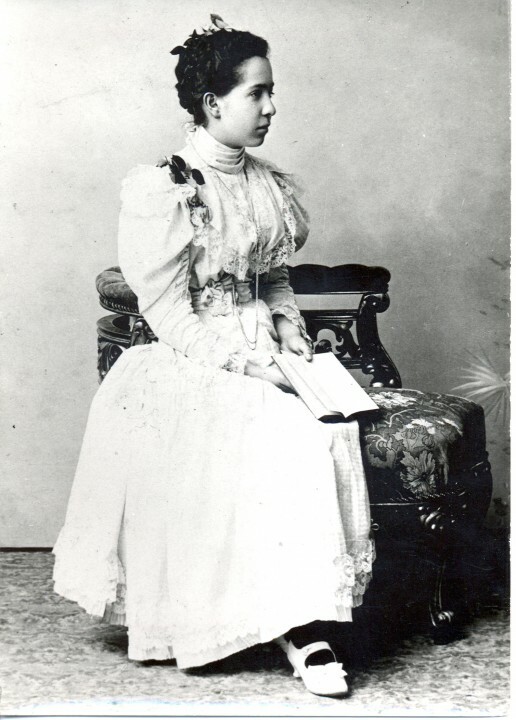 1905-1907 She takes private lessons in French and English in Celje. She is particularly enraptured with the French lessons, and discovers a talent for languages in herself. 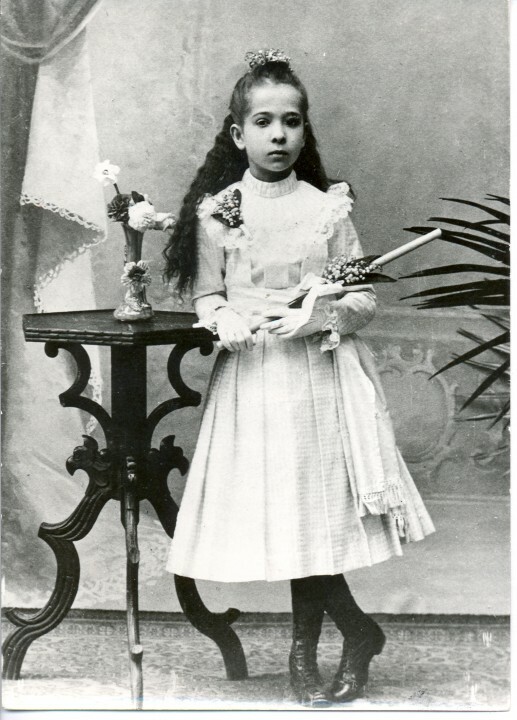 1907 She passes the state examination in French in Gorica, which is the first step towards her independence; next year, in 1908, she passes the state examination in English and becomes fully qualified for independent teaching. 1908 Alma sets with her mother on a great journey across Europe, they visit the Northern Italy, Switzerland, Paris, London, Brussels, and Germany. After returning to Celje, Alma starts teaching English and French, and dreams about studies in London; in autumn of the same year she leaves for London. 1908-1914 She finds a job in a translation office where she works during her stay in London; meanwhile, apart from her job, she gives English lessons to foreigners and learns the Scandinavian languages, Russian, Spanish, and Italian; she meets Asiatic people who live in London, and becomes acquainted with eastern philosophies and theosophy. She starts learning the basics of Sanskrit. She spends six months in Paris and gives up her plans to marry a son of the Chinese mandarin with whom she visits her mother in Celje at Christmas 1913. At the end of May 1914 she graduates with honour at the Society of Arts in eight languages. 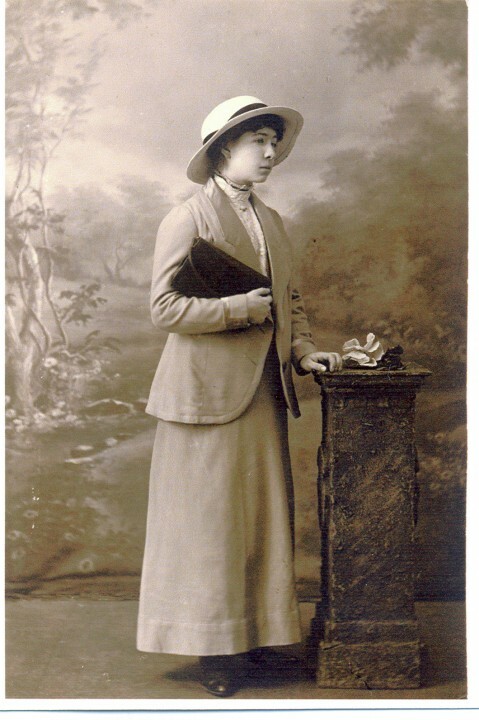 1914-1918 Soon after the outbreak of the World War I she leaves for Norway and Sweden for being a citizen of a hostile country, where she makes living teaching foreign languages, and spends a lot of time in libraries studying ancient civilisations. She finally decides to become a professional writer. Her first book, a play in three acts Die Kringhäusler, is published in Leipzig in 1918. In spring of 1918 she returns to Celje and founds a school for foreign languages. At the same time she becomes determined to travel around the world. She buys her first typing machine with her savings, famous "erika", which accompanies her until the end of her life. To be well prepared for the journey she trains herself in painting and learns geography, history, biology, natural science, and zoology. 1919 She leaves Celje on 24 November, with a humble sum of money, a typing machine, and an overall dictionary in ten languages, which she compiled by herself. After a long waiting she gets a visa for Japan. 1920 At the end of February she takes the ship to South America in Genoa, at the beginning of April she disembarks in Peru, in autumn of the same year she comes to Panama, where she is employed in the management of the Panama Canal as a sworn translator. 1921 From March to July she travels across the Middle America and Mexico, in August she arrives to San Francisco from where she sets off to Hawaii. There she is reached by her novel Mein kleiner Chinese, which was published in Dresden in the same year. 1922-23 She arrives to Japan where she accepts a job at the German Embassy, travels around the country, and socialises with the intellectuals and artists. 1923 In the second half of the year she moves on to Korea, Manchuria and China, and further to Formosa. There she visits hunters on human heads. From Hong-Kong she sets off for Australia, and visits Manila, Borneo, Pearl Islands, Celebes, Thursday Islands on her way and finally arrives to Sydney and Adelaide. 1924-1926 Her next stay is Auckland in New Zealand from where she moves on to Pacific Islands. On Fiji Islands, New Caledonia, New Hebrides, Caroline Islands, and New Guinea she lives like a Robinson among the natives. She falls sick with malaria and tropic dysentery, and escapes within a hair's breadth from the cannibals. 1926 She continues her travel along Indonesia, Java, Sumatra, Malaysian Peninsula, Thailand, and Burma. 1927 She visits Calcutta, Agra, Delhi, Lahore, and Karachi in India. She is reached by the letter from her dying mother and decides to return back home. She arrives in Celje exhausted, ill, and psychically broken upon the last days of 1927. 1928-1930 She immediately starts arranging her travel notes and materials she collected on the journey. 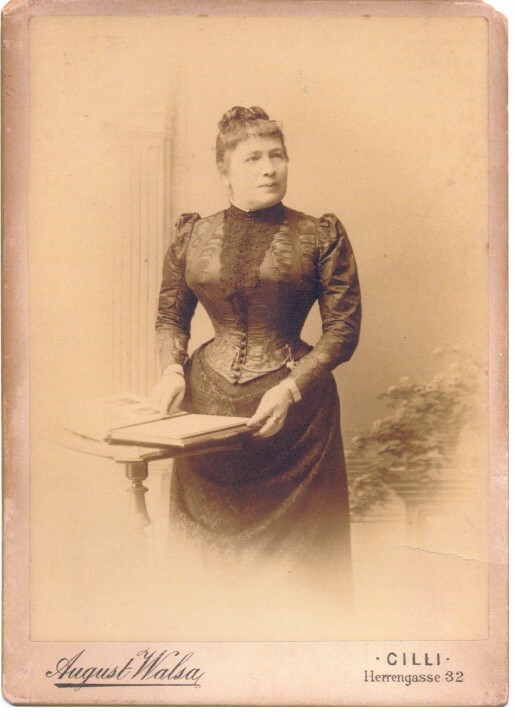 She gives first lectures in Celje, writes travel articles for German and English speaking public, for daily newspapers, women magazines, and historical ethnological and spiritual publications. She starts publishing her travelogues and writing novels, which are met with a favourable reception by the reading public in Europe. 1931-33 She frequently travels and lectures in European cities in women's and other clubs. The painter Thea Schreiber Gamelin, her "sister soul", comes to live permanently in Celje, and they remain inseparable until Alma's death. 1934-36 She stops writing exotic novels and dedicates herself to occultism and pre-historical civilisations. 1937-1939 She gives refuge to an anti-Nazi journalist Hans Joachim Bonsack and others, and stops publishing in the German press as an act of protest against Nazism. Under the pressure of the Germans living in Celje and the Kulturbund she exchanges her birth house in the town for a "villa" in Zagrad where she stays together with Thea until the end of the World War II. 1941-1944 Alma's works are banned in Germany, after the occupation of Yugoslavia she is imprisoned by the Gestapo and destined for a death camp but succeeds in rescuing herself through Thea's connections in the Third Reich. 1944-1945 In autumn of 1944 she joins Partisans. She hopes to be sent from the liberated territory in Bela Krajina (White Carniola) to English Allies in Bari, but this does not happen and she awaits the end of the war in Dalmatia. When the war ends she returns to Celje - to die, as her friend says. 1945-1950 The "villa" in Zagrad is denationalised, so she moves, together with Thea, in a small house at Pečovnik above Celje. They live in straitened circumstances. Alma is worn out and in poor health but she writes till the end. 1950 Alma M. Karlin dies of cancer on 14 January. Thea buries her two days later at Svetina where she rests still today.